Atmosphere Aerosol is a clear and non-toxic spray that adds haze to any room or still, windless area. Spray it and capture light rays or create smoky, foggy settings. It provides a convenient and effective alternative to fog machines or other heavy-duty equipment for photography and film capture applications. Simply pull it out of your bag and spray it shortly before the shoot. 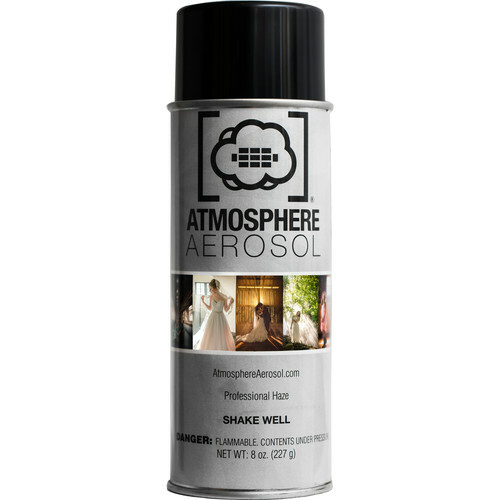 Box Dimensions (LxWxH) 7.7 x 2.7 x 2.6"
Aerosol Haze Spray for Photographers & Filmmakers is rated 5.0 out of 5 by 3. Rated 5 out of 5 by Anonymous from Can't beat it! As advertised. Great little can of haze. You get the look of a hazer without the machine. Does this set off smoke detectors? Ive used fog and haze machines in the past and innow it depends on the sensitivity of the detector, etc. but was just curious about others experiences. Unfortunately, the answer simply depends on the type of smoke detector that is being used. If an ionisation-type or photo-electric/ particle detection smoke detector is used, it can be set off by fog as they sense the fog particles just like smoke. Heat based detectors should be okay. The issue is you may not know which one you have, or the sensitivity of the particle detection smoke detector. If you are using the item indoors, it would be recommended to give your local fire department a call for assistance. They may either be able to assist you with performing a test to see if the item will be an issue for your particular type smoke detector, and/or if they see that the detector will be set off by the item, they may be able to offer to disable the unit and station a fire marshal or fireman in the venue during usage. WE DO NOT RECOMMEND DISABING A SMOKE DETECTOR YOURSELF. This may be illegal, and contacting your local fire station is highly recommended. Otherwise, I would recommend using the item outdoors in an open area (though you may still wish to contact the fire department so neighbors and passers-by do not think there is a fire and still call the fire department at the sight of smoke/haze/fog). If you are shooting in a public venue, I would recommend simply inquiring with the venue as to their rules regarding using smoke/haze. Hi! Can you fly with this can? I dont think so. it's a under pressure product which not allow to carry to fly.